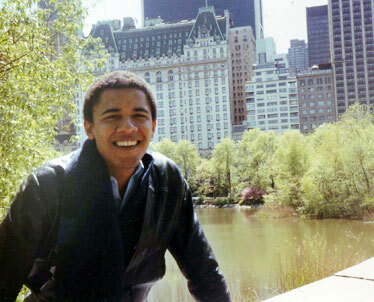 Barack Obama is shown in New York City while he was a student at Columbia University in this undated photo provided by his presidential campaign staff. Obama received his B.A. degree in political science from Columbia in 1983. NEW YORK » There was a time before Obama wore tailored suits -- when his wardrobe consisted of $5 military-surplus khakis and used leather jackets, and he walked the streets of Manhattan for lack of bus fare. It was a time well before the political arena beckoned, when his friends thought he might become a writer or a lawyer, but certainly not the first black man with a real chance to become president of the United States. Obama spent the six years between 1979 and 1985 at Occidental College in Los Angeles and then in New York at Columbia University and in the workplace. His memoir, "Dreams from My Father," talks about this time, but not in great detail; former roommate Sohale Siddiqi, for example, is identified only as "Sadik" -- "a short, well-built Pakistani" who smoked marijuana, snorted cocaine and liked to party. Obama's campaign wouldn't identify "Sadik," but the Associated Press located him in Seattle, where he raises money for a community theater. Together, the recollections of Siddiqi and other friends and acquaintances from Obama's college years paint a portrait of the candidate as a young man. They remember a good student with a sharp mind and unshakable integrity, a young man who already had a passion for the underprivileged. Some described the young Obama's personality as confident to the point of arrogance, a criticism that would emerge decades later, during the campaign. Not everyone who knew Obama in those years is eager to talk. Some explained that they feared inadvertently hurting Obama's campaign. Among his friends were Siddiqi and two other Pakistanis, all of them from Karachi; several of those interviewed said the Pakistanis were reluctant to talk for fear of stoking rumors that Obama is a Muslim. "Obama in the eyes of some right-wingers is basically Muslim until proved innocent," says Margot Mifflin, a friend from Occidental who is now a journalism professor at New York's Lehman College. "It's partly the Muslim factor by association and partly the fear of something being twisted." The young man Mifflin remembers was "an unpretentious, down-to-earth, solidly middle-class guy who seemed somewhat more sophisticated than the average college student." But another former classmate, Robert McCrary, now general manager of a contract sewing company, saw him differently: "He definitely had a cocky, sometimes arrogant way about him. ... He was not open to others." Of course, he was only 18 when he arrived at the small liberal arts college. His freshman roommates were Imad Husain, a Pakistani, who's now a Boston banker, and Paul Carpenter, now a Los Angeles lawyer. Carpenter recalled Obama as "a good bodysurfer" who had "a funky red car, a Fiat," and who also played intramurals -- flag football, tennis and water polo. "He was an athletic guy. He was gifted in that regard," said Carpenter. He also remembered Obama being "superbright." Obama had an international circle of friends -- "a real eclectic sort of group," says Vinai Thummalapally, who himself came from Hyderabad, India. When Obama arrived in New York, he already knew Siddiqi -- a friend of Chandoo's and Hamid's from Karachi who had visited Los Angeles. Looking back, Siddiqi acknowledges that he and Obama were an odd couple. Siddiqi would mock Obama's idealism -- he just wanted to make a lot of money and buy things, while Obama wanted to help the poor. "At that age, I thought he was a saint and a square, and he took himself too seriously," Siddiqi said. "He was genuinely concerned with the plight of the poor. He'd give me lectures, which I found very boring. He must have found me very irritating." Siddiqi fudged his credentials, saying he had a high-paying job at a catering company, but Obama "wanted no part of it. He put down the truth." But it wasn't exactly an ascetic life. There was plenty of time for reading (Gabriel Garcia Marquez, V.S. Naipaul) and listening to music (Van Morrison, the Ohio Players, Bob Dylan). The two, along with others, went out for nights on the town. "He wasn't entirely a hermit," Siddiqi said. Obama was a tolerant roommate. Siddiqi's mother, who had never been around a black man, came to visit and she was rude; Obama was nothing but polite, Siddiqi said. Finally, their relationship started to fray. "I was partying all the time. I was disrupting his studies," Siddiqi said. Obama moved out. In July 1985, after spending two years as a writer for a business newsletter and as a coordinator at City College in Harlem for an environmental and consumer advocacy group, Obama left New York for Chicago -- where he found a job, a wife and, eventually, a political career. Neither Hamid nor Chandoo would be interviewed for this story. But both have each contributed the maximum $2,300 to Obama's campaign, and records indicate each has joined an Asian-American council that supports his run for president. Both also are listed on Obama's campaign Web site as being among his top fundraisers, each bringing in between $100,000 and $200,000 in contributions from their networks of friends. Thummalapally has stayed in contact with Obama, too, joining him in Springfield, Ill., for the Feb. 10, 2007, announcement of Obama's run for the White House. Siddiqi has not kept in touch. His has been a difficult road; years after his time with Obama, Siddiqi says, he became addicted to cocaine and lost his business. But when he needed help during his recovery, Obama -- the roommate he drove away with his partying -- gave him a job reference. "My name is Hal Siddiqi, and I approve of this message. Vote for peace, vote for hope, vote for change and vote for Obama."